SCOTTSDALE – Customers can browse organic food, peruse designer-quality clothing and enjoy the aroma of high-end shampoo wafting around the space at this luxury boutique in Scottsdale. But this isn’t a high-class fashion boutique: It’s a store for dogs. 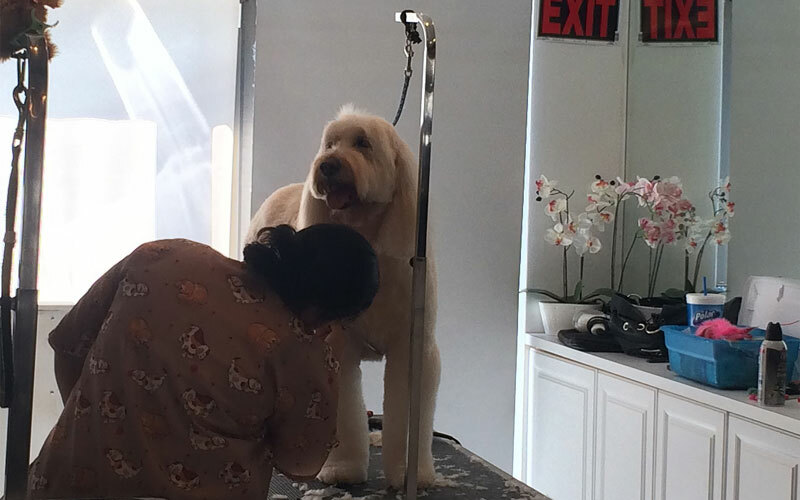 The business caters to people who want to spoil and pamper their pups. Griffin and her husband said business is good. They have expanded to a seven-person staff and have a waiting list for grooming clients. And Griffin predicted it will stay that way, regardless of recent headlines. 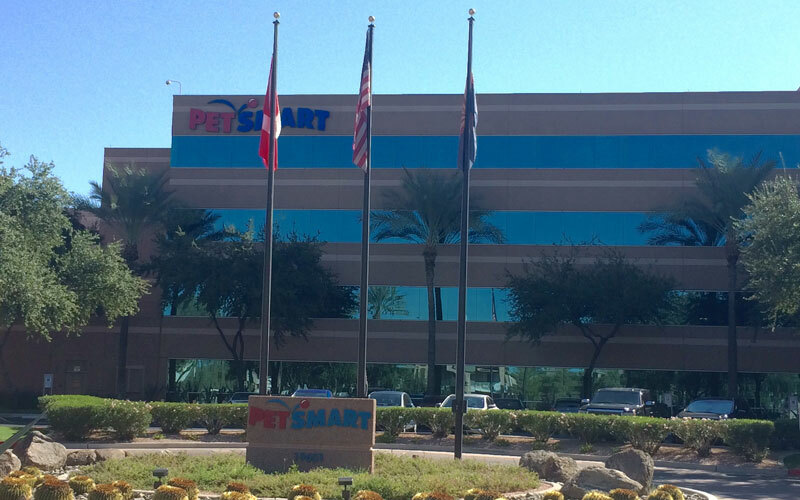 Rumors about a possible merger between big-dog players Phoenix-based PetSmart and San Diego-based Petco have circulated recently. Neither company has confirmed the move. Facing competition against a giant corporation doesn’t bother Griffin. She said her customers come through her doors with a different idea of how to pamper their pups. Oh My Dog! also sells luxury items Petco and PetSmart can’t necessarily stock on their shelves, Griffin said. For example, the Scottsdale boutique sells Sit To Be Tied – vintage designer collars made from designer neckties. Griffin isn’t alone. Lianne McKenzie, owner of Puppy Love Pet Grooming in Mesa, said she isn’t concerned about a mega corporation chasing away her business. But Shwana Shchuh, president and “chief pet wrangler” for the professional group Women in the Pet Industry Network, disagreed. She said a big box retail store for pets could mean trouble for small business owners that offer services to pets. Another group that may be affected by a merger? Arizona employees. PetSmart was founded in the Valley in 1989. It has grown to about 1,400 stores within the U.S. and Canada. In Arizona, it employs 3,540 workers within its stores and corporate office. And it’s the 43rd largest non-government employer in the state, according to 2015 figures from The Arizona Republic’s 100 list. While it’s unclear whether a merger would affect these jobs, the companies could face challenges. The Federal Trade Commission must approve all large business mergers to prevent monopolies. Reports from the research firm IBISWorld indicated the two companies could control nearly 58 percent of the market – with PetSmart currently controlling 39 percent and Petco with 19 percent. To prevent this, the two companies may close various locations to appease FTC officials, according to an expert cited by CBS News. “If it affects closure of locations, I would be upset if mine closed. I use it all the time,” said Jenny Carter, a PetSmart customer from Phoenix. She said she takes her Beagle, Paige, to the “vet, day care and the groomer” at PetSmart. Carter said she also worries the store she enjoys could be compromised by the deal. “If Petco becomes more like PetSmart, it’s great. But if PetSmart over takes PetCo, it’s not so great,” she said. A PetSmart spokeswoman declined comment, stating that the company does not respond to rumors. Petco did not respond to requests for comment. In March, PetSmart became private, bought for $8.7 billion by British firm BC Partners. Petco, which has been under the ownership of Leonard Green & Partners and TPG since 2006, also has made headlines. The company released an IPO to go public last month and expects to raise $800 million, according to news reports. This isn’t the first time company officials have considered a deal. The stakes are high for control of a lucrative market – with the pet industry estimated at $60.59 billion. This year, it’s predicted pet consumers will spend nearly $23.04 billion on food and another $14.39 billion on medicine and supplies, according to the American Pet Products Association. The rest is estimated to fund grooming, vet care and animal purchases. But ultimately, Shchuh said customers will judge any pet store – be it a giant corporation or a small locally-owned shop – on the level of service.